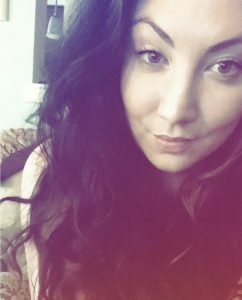 Easter is on Sunday, finally! I love this time of year, especially decorating for the Easter holiday, and eating delicious things on Easter Sunday. I know a lot of families do Easter brunch, my family does a traditional early Eater ham dinner. No Sunday Funday, no matter what holiday it is, is complete without some fabulous cocktails. Today I’m sharing some spring beverages that could be perfect for this upcoming Sunday, whether you’re celebrating Easter, or any other holiday, with your family…or not! 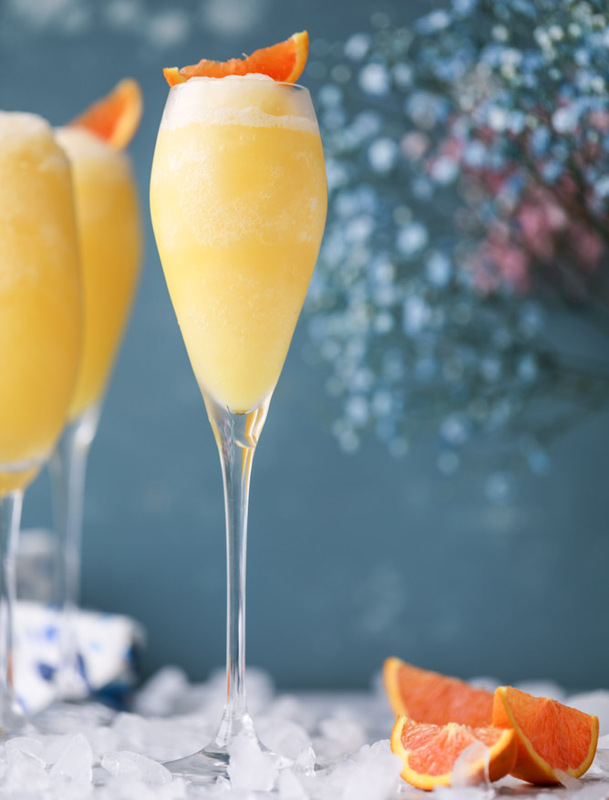 If you’re doing a Sunday brunch, welcome the warm weather with these Frozen Mimosas from How Sweet Eats! Jessica is my absolute favorite food blogger and aside from regularly using her cookbook, I’m always pinning her new recipes from my inbox each day. 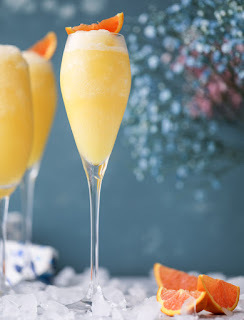 I love the idea of taking something so incredible as a mimosa and adding a twist by making it frozen. It’s such a pretty drink and adding the orange slice for garnish makes the presentation that much better! 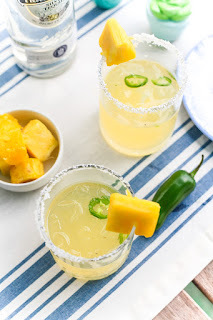 For a more cocktail hour appropriate drink, I think this bright and sunny looking Spicy Pineapple Margarita, created by The Noshery, is a fun and different drink to enjoy on a special day. If spice isn’t your thing, then leave out the jalapeños and you’ll still be enjoying a refreshing pineapple margarita! Another delightful drink from How Sweet Eats, this time taking a turn toward vodka with this Clementine Vodka Soda. Vodka soda is my favorite drink…ever…and I loveeeee clementines, so seeing this drink made me so excited! The though of making my own clementine juice and simple syrup makes the drink sound that much better. Not to mention, it’s super easy to throw together and adding the mint takes the presentation up a notch. 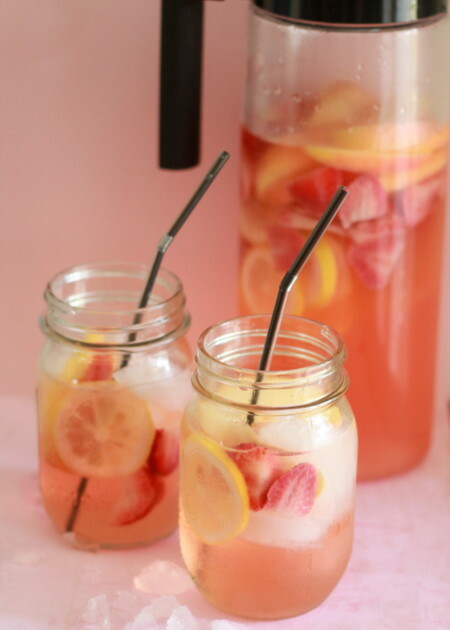 If you’re more of the sangria type I think this White Strawberry Lemon Sangria created by The Kitchen Treaty is a great choice if you like things on the sweeter side. The color is gorgeous, and it’s very easy to make a large pitcher of this for the day. 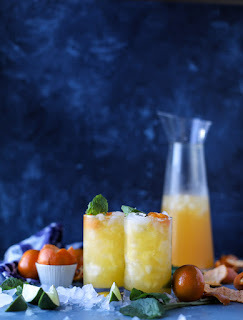 I think this drink is perfect for a brunch or early afternoon gathering. Sitting outside with friends & family, passing around a pitcher of this sangria sounds like the most perfect Easter Sunday to me! 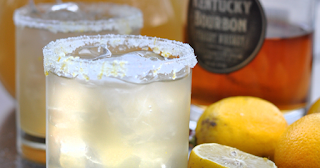 I can’t necessarily say I would drink a few glasses of this next drink, since Bourbon really isn’t my thing- but I know how trendy it is nowadays, so I thought I should add it in to this list! Also, I think the twist of a Bourbon “Arnold Palmer”, by Bon Bon Break, sounds fun and exciting for those of you that enjoy Bourbon! I love a good Arnold Palmer and while I’m still trying to strengthen my Bourbon tastebuds, this drink seems like it would be tasty! Tweet me, @elizabethmayce, any fun drinks you’ll be making this Easter Sunday, or on your next Sunday Funday!